EASA 21J approved design organisation no EASA 21J.538. 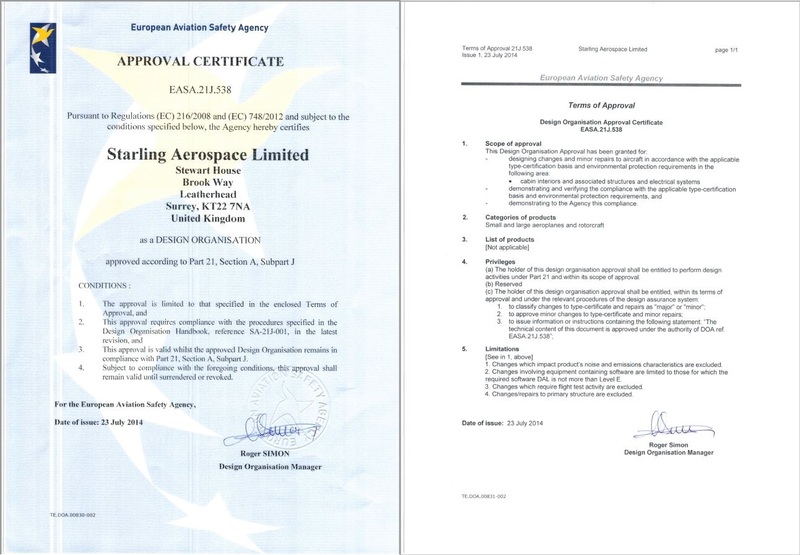 Starling Aerospace design team has the authorisation to develop Minor Mod through STC approvals for all cabin interior modifications from simple seat cover changes through to complex cabin reconfigurations. Cabin Refresh Projects including, carpet change, seat covers for both 9 G and 16G aircraft, new bulkhead and sidewall recovering, paint and colour changes. Galley and Lavatory upgrades including new vanity and sink design, mirrors, panel trim and finish, flooring and LED lighting. LOPA Changes including new seat installations, cabin reconfigurations from single to multiclass seating or the reverse, new monument installations, curtain and bulkhead dividers, In-seat power and IFE upgrade. Repair and Modifications including repair schemes for interior components that are damaged, require replacement or alteration. New Monument Design including Galleys and Lavatories, specialised Cabinets and Storage Units, Bulkheads and Dividers, VIP cabin reconfigurations for new Ceiling Panels, Valance and Transition Panels, Staterooms and Corporate reconfigurations, LED lighting. Specialised Seat Manufacture including in-house design and approval of divans and seating approved to both 9G and 16 G applications for large aircraft over 19 passengers. Our existing EASA approved seat frames can be modified to suit specific installations in both commercial and VIP installations.